Thank you for your interest in myself and my artwork. Below you will find a list of frequently asked questions. I hope they will answer any questions you may have, but if not, please feel free to contact me! 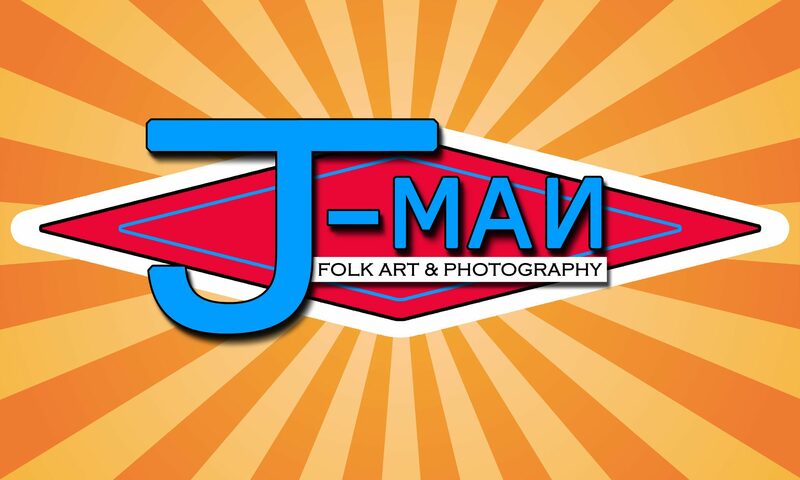 What in the heck is a J-MAN? That is my nickname. My birth name is Jason, which, let’s face it, is rather boring. Other than Jason Alexander, Jason Aldean, and Jason and the Argonauts, there are few famous Jasons. My entire life has been spent responding to every name other than Jason such as J-ROCK, J-DAWG, Stupid, and Jackass. My in-laws have called me J-MAN since I first met them in 1997. It seemed like a good idea when I started signing my paintings with the moniker. What in the heck is a *insert your name here*? Why is the N backwards in all your paintings? Are you illiterate? No. I am not illiterate. I read books frequently. The N is backwards as a tip of my hat to the artists that inspired me to do what I do such as Thornton Dial, Sr., Mose Tolliver, Grandma Moses, Purvis Young, Howard Finster, Jimmy Lee Sudduth, and so many more who were, for the most part, poor and under-educated and therefore wrote a lot of letters backwards. Thank you. Will you take $25 for that $300 painting? No. My paintings take an extremely long time to create. I first start with an idea. The idea is then sketched out in miniature on an index card or laid out in the digital realm. Next, I cut the plywood to size, sand it, then prime the wood, after which I then lightly sand again. The image is then transferred to the wood, which roughly translates to I sketch it all out by hand. Again. The painting of the image comes next. Depending upon the detail of the image and the size of the image, this usually takes anywhere from ten hours to forty hours. Then I paint the lines. As I’m sure you would imagine, the lines generally take about twice as long as the image itself. At this point, I am only half finished with the painting. I still have to gently sand the lines, sign the back of the painting, attach the hanging wire, cut the frame pieces, paint the frame pieces, glue/nail the frame pieces to the painting, touch up the paint on the frame pieces from the nailing, and finally varnish the painting. Varnishing usually takes no less than two coats, if not three. All this has to be done before I can take a pic of the painting so I can add it to my online store, post it on Facebook, carefully load it into my truck and drag it to the gallery or to market so you can ask me this stupid question. Really! WTF! Next time I need someone to do whatever it is you do, how about I pay you one twelfth of your regular rate? Okay? Then again, I may take it. Never hurts to ask, right? After all, I am a starving artist. My child can do this! What is your favorite William Faulkner book? I prefer John Faulkner. “Cabin Road” is one of the funniest books I’ve ever read! As for William Faulkner, “As I Lay Dying” would definitely be my favorite… right behind “Cabin Road”. Is it okay if I paint William Faulkner with a saying that you’ve already used, back in 2010, such as “Faulk Yeah!” and hang it in the business I founded and just franchised in Oxford, even though I don’t live in Oxford and the only ties I’ve ever had there were attending football games back in the day with my bros? No. My lawyer will be contacting you. If I painted a painting of William Faulkner with a saying that you used back in 2010, such as “Faulk Yeah!”, and hung it in the business I founded and just franchised in Oxford, even though I have never actually lived in Oxford and the only ties I’ve ever had there were attending football games back in the day with my bros… would that confuse your fans? Is it okay if I paint a copy of one of your paintings without your permission and send it to a friend for their birthday so long as I send you a picture of it? Is it okay if I paint a copy of one of your paintings without your permission and hang it in a gallery you’ve had work hanging in? No. My lawyer will be contacting you. As well as the gallery. Is it okay if I paint a copy of your paintings? Ask for permission first. The answer will probably be no. Who are you? Are you the police? No, I don’t do drugs. What are drugs? Are you always this hateful? How do I reserve a space at the Oxford Maker’s Market? You visit their website, and follow the directions. You do not contact me through my personal or business pages. Thank you.